Light is a symbol of hope and guidance. A Memory lamp can be used to share in the happiness of those we know and love, as well as comfort those in mourning. Our unique Memory Lamps also known as 'Gifts of Light' include sympathy gifts, bereavement, condolence, remembrance, wedding, retirement, birthday, and gifts for all of life's occasions. Memory lamps can be displayed at a loved one’s service or wake, adding ambiance as well as touch of warmth and comfort. 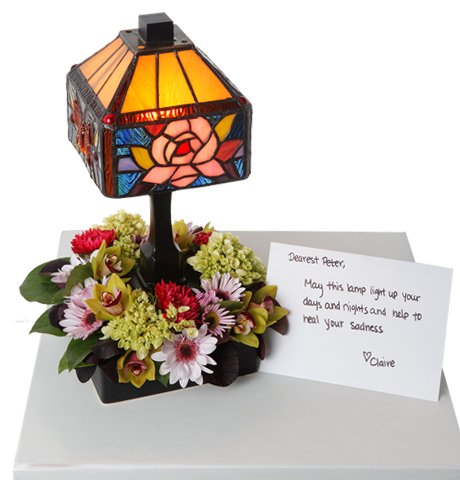 They can be accented with fresh flowers or stand alone to become a sparkling light of cherished memoires. Each gift can be personalized with a special message for funeral as a personal gift for remembrance. Please accept condolence for your loss. The gift of light is intended to provide warmth and comfort as you begin healing and reflecting. Every day when you turn on this lamp I hope you feel the love of your ___________ and all the great memories come back to life and warm your heart. The art glass lamp has been specifically picked out by us to bestow honor and respect to the memory of ________. Each time you turn on this lamp may you remember the wonderful bond you shared. For more card recommendations, Click Here. Spark a Memory Flowers and Lamp!